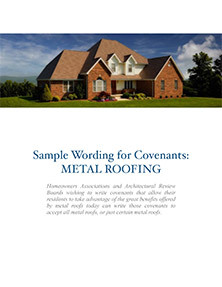 Metal is the best roofing choice for making your neighborhood or condo community environmentally friendly. Made with sustainable materials and recycled content, homeowners have latched onto the various green benefits of metal roofing. Check out these green benefits that will ensure your neighborhood is the greenest around. Aluminum roofing has 95% recycled content. Steel and copper have 35% recycled content. Most of the recycled content is post-consumer. A metal roof is perhaps the biggest purchase that can be made for a home which closes the recycling loop. Minimal life cycle carbon footprint, unlike traditional shingles which are oil-based and short-lived. Special coatings and unique designs reduce energy costs by up to 20% or even more by keeping heat from entering your home’s attic. Beautiful shingle, shake, slate, and tile profiles feature an Integral dead airspace that stops conductive heat transfer, much like a thermal pane window. Lower cooling loads can extend air conditioner life. Easily supports the application of photovoltaic solar collection systems. Low weight allows installation over most existing roofs, eliminating the need for landfill disposal of old roofing. Low weight minimizes embedded transportation cost. Today’s quality metal roofs feature long-lasting fade and chalk resistant Kynar and Hylar systems. Additionally, they can be repainted in 50+ years rather than replaced. Low weight roofing supports and encourages longer structural life of a building. 100% recyclable if it is ever replaced. Recycled content metal has much lower embodied energy than virgin metal. No other roofing material offers this great variety of ecologically sound attributes. To learn more about the environmental benefits of our metal roofing products, contact us for a no-obligation conversation or consultation. Contact Us for a No-Obligation Conversation or Consultation.